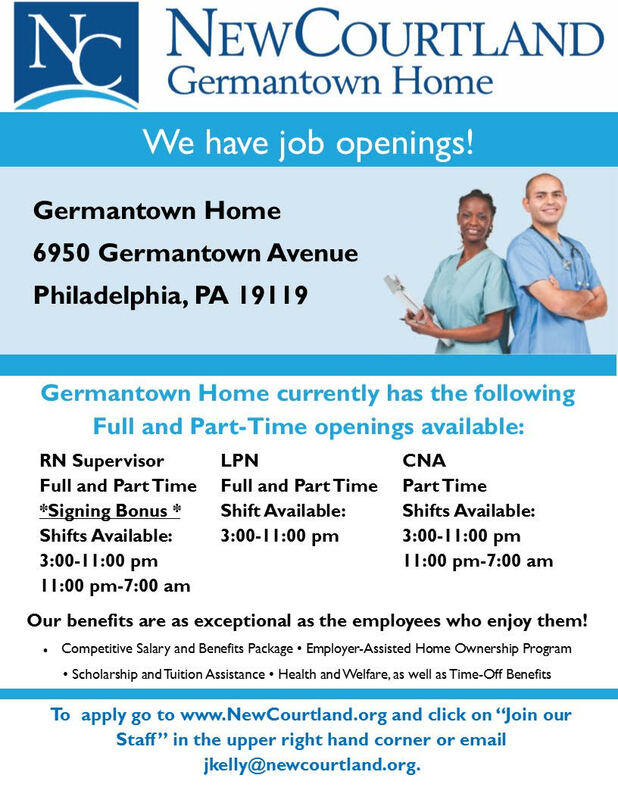 We have job openings for RN Supervisor, LPN and CNA, Full and Part Time positions at New Courtland Germantown Home, 6950 Germatown Avenue, Phila PA 19119. Visit NewCourtland.org to apply. This May we have an opportunity to elect Pro-Union candidates that support public/private service employees and their families’ right here in the city of Philadelphia. We will be reminding our brothers and sisters to vote on Tuesday, May 21, 2019 for our endorsed candidates for Mayor, City Council, City Commissioner, Sheriff, Register of Wills and a number of state and municipal judgeships. 4:00 – 6:00pm 1319 Locust St.
Thursday, April 18 Pre-election canvass 4:30 – 8:30pm 1319 Locust St.
Thursday, April 25 Pre-election canvass 4:30 – 8:30pm 1319 Locust St.
Sunday, April 28 Pre-election canvass 12:00 – 4:00pm 1319 Locust St.
Sunday May 5 Pre-election canvass 12:00 – 4:00pm 1319 Locust St.
Thursday, May 9 Pre-election canvass 4:30 – 8:30pm 1319 Locust St.
Sunday May 11 Pre-election canvass 12:00 – 4:00pm 1319 Locust St.
Monday May 13 Pre-election canvass 4:30 – 8:30pm 1319 Locust St.